Bush Proposes to Extend and Expand PATRIOT Act, 4/19/2004. April 19, 2004. President Bush gave a speech in Hershey, Pennsylvania about terrorism and the USA PATRIOT Act. He said that all of the provisions of the Act that are scheduled to expire should be permanently extended, that several new provisions should be added, and that the various legislative proposals to roll back certain provisions of the Act should all be rejected. The speech was long, focused, and specific. Bush discussed several existing sections of the PATRIOT Act, and several proposed additions. While the PATRIOT Act is a huge bill that addresses a wide range of issues, much of what President Bush discussed relates to Titled II of the Act, covering electronic surveillance. The PATRIOT Act modified numerous sections of the criminal code, which is codified at Title 18, and the Foreign Intelligence Surveillance Act (FISA), which is codified at 50 U.S.C. § 1861, et seq. Other sections of the PATRIOT Act address topics such as biological weapons, border protection, terrorist financing infrastructure, and immigration and alien detention and deportation, and assisting victims of terrorism. President Bush did not focus on these issues. President Bush (at right) discussed the war on terrorism generally. Then he reviewed many of the provisions in the PATRIOT Act, and explained why they make sense. He then said that "I want you to keep in mind what I've just told you about the Patriot Act the next time you hear somebody attacking the Patriot Act. The Patriot Act defends our liberty. The Patriot Act makes it able for those of us in positions of responsibility to defend the liberty of the American people. It's essential law." The President emphasized several provisions of the PATRIOT Act that are scheduled to expire. He said that "The reason I bring it up is because many of the Patriot Act's anti-terrorism tools are set to expire next year, including key provisions that allow our intelligence and law enforcement agencies to share information. In other words, Congress passed it and said, well, maybe the war on terror won't go on very long, and, therefore, these tools are set to expire. The problem is, the war on terror continues." Also, President Bush did not use this speech to advocate certain other changes to criminal law and procedure, foreign intelligence law, or communications law, that are not addressed in the PATRIOT Act, but which do pertain to combating terrorism. For example, Bush made no proposals regarding cyber crimes, encryption controls, or expanding the Communications Assistance for Law Enforcement Act (CALEA). See also, White Press Office release on the President's speech. Extension of the PATRIOT Act. Bush said that "I'm starting today to call on the United States Congress to renew the Patriot Act and to make all of its provisions permanent." § 209 pertaining to "Seizure of voice-mail messages pursuant to warrants"
§ 214 pertaining to "Pen register and trap and trace authority under FISA"
President Bush then reviewed several specific sections that are either scheduled to sunset, or that pending bills would sunset or modify. Information Sharing. Bush stated that "before September the 11th, law enforcement, intelligence, and national security officials were prevented by legal and bureaucratic restrictions from sharing critical information with each other, and with state and local police departments." He elaborated that "We had -- one group of the FBI knows something, but they couldn't talk to the other group in the FBI -- because of law and bureaucratic interpretation. You cannot fight the war on terror unless all bodies of your government at the federal, state, and local level are capable of sharing intelligence on a real-time basis. We could not get a complete picture of terrorist threats, therefore. People had -- different people had a piece of the puzzle, but because of law, they couldn't get all the pieces in the same place. And so we removed those barriers, removed the walls. You hear the talk about the walls that separate certain aspects of government; they have been removed by the Patriot Act. And now, law enforcement and intelligence communities are working together to share information to better prevent an attack on America." § 203 pertains to the sharing of criminal investigation information. § 203(b), pertaining to authority to share electronic, wire and oral interception information, is scheduled to sunset. § 203(d), pertaining to foreign intelligence information, is also scheduled to sunset. However, § 203(a), pertaining to grand jury information, is not scheduled to sunset. Both the Sen. Leahy and Sen. Craig bills would both sunset both §§ 203(b) and 203(d). See story, titled "Bush Opposes Congressional Proposals to Roll Back Parts of PATRIOT Act", also in this issue. Also, § 701 of the PATRIOT Act (which is not in Title II, and is not scheduled to sunset) provides for the expansion of regional information sharing system to facilitate federal state local law enforcement response to terrorist attacks. Roving Wiretaps. President Bush stated that "Before September the 11th, investigators had better tools to fight organized crime than to fight international terrorism. That was the reality. For years, law enforcement used so-called roving wire taps to investigate organized crime. You see, what that meant is if you got a wire tap by court order -- and, by the way, everything you hear about requires court order, requires there to be permission from a FISA court, for example." He continued that "So the crime boss, he'd be on the cell phone, maybe thinking somebody is listening to him, would toss the cell phone and get on another cell phone. And the law allowed for our drug busters to follow the person making the calls, not just a single phone number. So it made it more difficult for a drug lord to evade the net that we were trying to throw on him to capture him with." He added that "We couldn't use roving wire taps for terrorists. In other words, terrorists could switch phones and we couldn't follow them. The Patriot Act changed that, and now we have the essential tool. See, with court approval, we have long used roving wire taps to lock up monsters -- mobsters. Now we have a chance to lock up monsters, terrorist monsters." § 206 of the PATRIOT Act, pertaining to "Roving surveillance authority under the FISA", amended 50 U.S.C. § 1805. § 206 provides in full that "Section 105(c)(2)(B) of the Foreign Intelligence Surveillance Act of 1978 (50 U.S.C. 1805(c)(2)(B)) is amended by inserting `, or in circumstances where the Court finds that the actions of the target of the application may have the effect of thwarting the identification of a specified person, such other persons,' after `specified person'." § 206 is scheduled to sunset. Both the Craig and Leahy bills would also sunset this section. Critics of roving wiretap authority state that it does not specify the target of the wiretap or the place to be wiretapped, and that this increases the likelihood that the conversations of innocent people will be intercepted. Delayed Notification of Search Warrants (aka Sneak and Peak). "The Patriot Act authorizes what are called delayed notification search warrants", said President Bush. "These allow law enforcement personnel, with court approval, to carry out a lawful search without tipping off suspects and giving them a chance to flee or destroy evidence. It is an important part of conducting operations against organized groups." He added that "Before September the 11th, the standards for these kind of warrants were different around the country. It made it hard to have kind of a national strategy to chase down what might be a terrorist group. The Patriot Act provided a clear national standard and now allows these warrants to be used in terrorism cases. And they're an important tool for those who are on the front line of using necessary means, with court order, to find these terrorists before they hurt us." The relevant section of the PATRIOT Act is § 213. It is not scheduled to sunset. However, there are legislative proposals to modify the procedure for obtaining delayed notification of search warrants, including the Leahy and Craig bills. (3) the warrant provides for the giving of such notice within a reasonable period of its execution, which period may thereafter be extended by the court for good cause shown." Business Records. Bush stated that "Before September the 11th, law enforcement could more easily obtain business and financial records of white-collar criminals than of suspected terrorists. See, part of the way to make sure that we catch terrorists is we chase money trails. And yet it was easier to chase a money trail with a white-collar criminal than it was a terrorist. The Patriot Act ended this double standard and it made it easier for investigators to catch suspected terrorists by following paper trails here in America." President Bush is speaking about § 215 of the PATRIOT Act, which is inconspicuously titled "Access to records and other items under the Foreign Intelligence Surveillance Act". It has, however, turned out to be one of the most controversial provisions of the Act. The Foreign Intelligence Surveillance Act (FISA) only applies to foreign powers, and agents of foreign powers, including international terrorists. § 501 of the FISA enables the FBI to obtain from a judge or magistrate an order requiring the production business records. While the statute does not expressly include library records, it is not disputed that library records could be obtained. Although, Attorney General John Ashcroft has stated in September 2003 that it has not been used to obtain library records. Currently, § 501 (as amended by § 215) requires that an application to a judge or magistrate "shall specify that the records concerned are sought for an authorized investigation conducted in accordance with subsection (a)(2) to obtain foreign intelligence information not concerning a United States person or to protect against international terrorism or clandestine intelligence activities." Allowing § 215 to sunset, or passing a bill such as Sen. Craig's, would raise the standards for obtaining a FISA order for business records. The American Library Association (ALA) has been the most vocal opponent of § 215. And, Attorney General John Ashcroft has rebutted its criticisms. See also, stories titled "Ashcroft Says American Library Association Attacks on PATRIOT Act Are Hysteria and Hyperbole" in TLJ Daily E-Mail Alert No. 740, September 16, 2003; "Ashcroft and Critics Continue Debate Over Section 215 Access to Business Records" in TLJ Daily E-Mail Alert No. 745, September 24, 2003; "Ashcroft Addresses Roving Wiretaps and Access to Business Records" in TLJ Daily E-Mail Alert No. 746, September 25, 2003; and "Ashcroft Defends PATRIOT Act in Speech" in TLJ Daily E-Mail Alert No. 781, November 18, 2003. Proposal Regarding Administrative Subpoenas. President Bush stated that "there are some additional things that Congress should do -- must do, in my judgment -- to strengthen authorities and penalties to defend our homeland. There's something called administrative subpoenas -- this is the authority to request certain types of time-sensitive records without the delay of going through a judge or a grand jury." Bush argued that "These are critical for many types of investigations. For example, today they're used for health care fraud cases. In other words, those who investigate can use an administrative subpoena to run down somebody cheating the health care system. Yet, in terrorism cases, where speed is of the essence, officials are barred from using administrative subpoenas." "That doesn't seem to make much sense to me", said Bush. President Bush has advanced this proposal before. He gave a speech at the FBI Academy at Quantico, Virginia, on September 10, 2003 in which he stated that the Congress should pass legislation giving law enforcement new tools, including administrative subpoena power, to fight terrorism. Also, on September 9, Rep. Tom Feeney (R-FL) introduced HR 3037, the "Antiterrorism Tools Enhancement Act of 2003", for this purpose. See, story titled "Bush Proposes Expanded Administrative Subpoena Power" in TLJ Daily E-Mail Alert No. 738, September 12, 2003. Bush's Other Proposals. 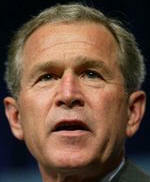 President Bush also used his speech in Hershey to propose other changes to federal law. First, he proposed making it permissible for Judges to deny bail in terrorism cases. He stated that "People charged with certain crimes today, including some drug offenses, are eligible for bail only in limited circumstances. But terrorist-related crimes are not on that list. Think about what that means. Suspected terrorists could be released, free to leave the country, or worse, before their trial. And that doesn't make any sense. The disparity makes no sense. If a dangerous drug dealer can be held without bail, the Congress should allow the same treatment for terrorists." Second, the President proposed that the death penalty should be available in terrorist crimes that result in death. He stated that "Under existing law, the death penalty applies to many serious crimes that result in death, including sexual abuse and certain drug-related offenses. Some terrorist crimes that result in death do not quality for capital punishment. That makes no sense to me. We ought to be sending a strong signal: If you sabotage a defense installation or nuclear facility in a way that takes an innocent life, you ought to get the death penalty, the federal death penalty."